Sometimes you just want to move. This is a collection of practices designed to challenge your strength, build stamina, generate heat, and inspire the opening of your heart. Conscious flow is all about intention. Brenda guides us through a dynamic conscious flow to awaken our intentions and build strength, stamina, and positivity. She offers variations as we play towards challenging arm balances, inversions, and deeper backbends. Brenda encourages us to set our intentions as we move with her in Season 1. A creative and challenging practice to help us cultivate the balance of steadiness and ease. Alexandra's sequences are both fluid and dynamic, keeping our bodies in a perpetual dance-like wiggle, shimmy, and flow that speaks to her interest in both strength and innovative and creative expression of movement. Alexandra welcomes us to practices designed to inspire our creative spark. Alexandra guides us through a simple supine investigation to identify two of the deepest layers of our core: our transverse abdominals and psoas. Alexandra guides us through a progressive set of abdominal strengtheners to bring our awareness to our center and stability to our core. The act of finding connection with the world around us begins through a fierce exploration of the challenges and vulnerabilities available in our physical practice. Jessica's humor, joy, and lightness invites us to play with her in the asana in a way that allows us meet our challenges with a smile. Jessica welcomes us to Season 3 with a focus on joy, humor, and finding fierce connection to the Self and the world around us. Jessica shares a meditation designed to root and ground us in our bodies and connect us to our human experience. 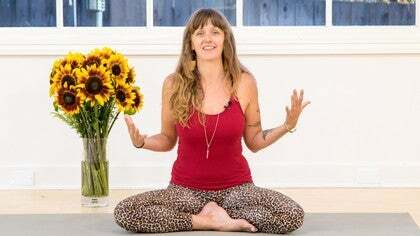 Brenda is back and this season she leads us in a series of playful and dynamic vinyasa flow classes to help us move out of our heads and into our hearts. Each practice will start with grounding postures and build up to a repetitive and rhythmic flowing sequence to help you feel present and alive. Brenda welcomes us to Season 4, where she will lead us in a series of flow classes to get out of our heads and into our hearts. Brenda guides an energetic sequence that incorporates core work, fire balls, and standing splits, building towards Adho Mukha Vrksasana (Handstand). With an emphasis on creating spaciousness in the side body, Brenda guides us in a steady, strong, and rhythmic flow to enliven your day. In Season 5, Rosemary brings her love of the creative and explorative space available within to her vinyasa sequences. With clear and spacious guidance, she hopes to shake up our standard practice offering experiments designed to meet our moods, bodies, and what we're interested in on a given day. This season will explore deep backbending, hip opening, creative lunge sequencing, and an essential flow practice. In Season 6, Audra offers a collection of dynamic and groovy vinyasa flow sequences with life lessons to match. Her classes will include creative transitions and movements to help you be with yourself and allow the opportunity to practice radical self-love. Audra introduces us to Season 6 of The Vinyasa Show, where she will offer a collection of dynamic and groovy flow sequences. This playful and challenging flow prepares us for Krounchasana (Heron's Pose). You will feel bright, strong, and proud of yourself. After sharing a story of Ganesha, Audra guides us in a dynamic sequence designed to explore moving courageously through difficult transitions. Move like you. In this season, Sarah shares a variety of sequences to help you generate heat, build strength and flexibility, and invite a fresh flow of vibrancy and energy into the body. This season, Sarah will offer sequences to help you generate heat, build strength and flexibility, and invite a fresh flow of energy into the body. Sarah shares a flow to promote a sense of rootedness with a series of Moon Salutations and a hip-opening sequence. You will feel more grounded. Sarah guides us through an invigorating flow, creating freedom in the shoulders, hips, and thighs in preparation for Natarajasana (Dancer Pose). This season, Nicole will share a wide variety of sequences from gentler, slower practices to more dynamic and playful flows to help enliven your day. Nicole guides us in a seated mediation to help us align, ground, and center. 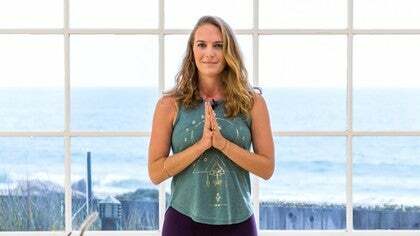 Nicole guides us through Surya Namaskars (Sun Salutations) and deep and expansive hip openers to warm and wake-up the body, heart, and mind. This season, Mary Beth will share a series of spacious Vinyasa flow practices to promote a sense of balance in the body, breath, and mind. Throughout the season, we will explore twisting, arm balancing, hip and heart opening, and inversions. You will feel more calm, centered, and spacious. This season Mary Beth will share a series of spacious Vinyasa practices to promote a sense of balance in the body, breath, and mind. Mary Beth guides us in a slow, rhythmic Vinyasa sequence with an emphasis on twisting. We create more space in the side body, shoulders, and hips. Mary Beth draws our attention towards compassion and the heart center, guiding us in a slow, rhythmic flow to awaken the shoulders, chest, and spine.